Researchers have discovered evidence that the greater vasa parrot is capable of using tools to ensure it gets enough calcium. Man has long believed that his use of tools was what differentiated him from other creatures in the animal kingdom, but recent research suggests that tool use is far from a specific trait of Homo sapiens. According to a report from Phys.org, scientists from the University of York and the University of St. Andrews have found evidence that greater vasa parrots can use tools as well. 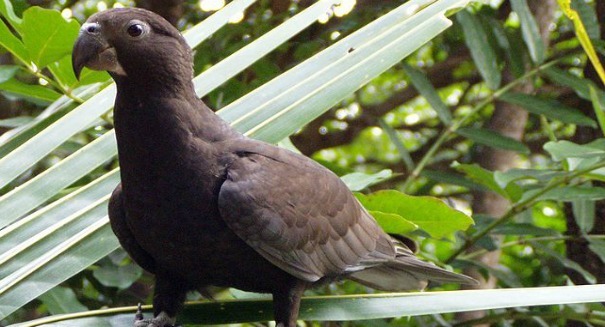 Researchers from the Department of Psychology at York University studied 10 captive greater vasa parrots, known as Coracopsis vasa. They observed the birds developing a novel technique that used tools to extract calcium from seashells. The birds were also found to share the tools amongst themselves, signifying that their use of the tools was on some level a conscious decision. The birds were seen using small pebbles or the pits from a date to grind powder or tiny chips off of seashells, which would be ingested to meet the birds’ calcium needs. The behavior was never before observed in this species, and represents the first instance in which a nonhuman species understood the concept of grinding. It is also one of the few species observed sharing tools with other individuals. The scientists filmed the parrots over an eight-month time period, and found that 50 percent of the birds were capable of using pebbles or date pits to break off calcium from the seashell. The birds were most interested in the cockle shells laid throughout their pens from March to mid-April, the time right before breeding season. Researchers initially that the birds were trying to maximize their calcium intake for the production of eggs, but were surprised to find that males were the most interested in the shells. Males were observed regurgitating food into the females’ mouths right before copulation, which suggests that they were acting as vessels for the calcium needed to form strong eggs. The study was published by the Royal Society in the journal Biology Letters. A press release from York describing the details of the study can be found here.